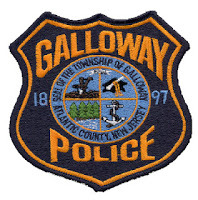 At 11:42 PM Galloway Police responded to the 300 Block of Jimmie Leeds Rd for a disturbance. It was reported that a male subject was trying to stab another male with a knife inside of the residence. K-9 Officer Scott Winneberger arrived on location with his K-9 Partner Lycos and was met outside by a subject identified as John Manwaring Jr., who was yelling threats and trying to keep officers from entering the residence. As officers approached, Manwaring failed to comply with Officers’ orders and attempted to reach for a homemade serrated sword. He was then apprehended by K9 Lycos. Manwaring was taken into custody without further incident. The serrated sword was recovered and a second weapon, a knife, used in the original incident was also recovered. Manwaring was charged with aggravated assault, possession of a weapon, possession of a weapon for unlawful purpose, criminal trespass and obstructing. His bail was set by Judge Freed at $50,000 cash. He received medical attention and was lodged in the Atlantic County Jail. None of the Officers including K-9 Lycos were injured during the incident.